Every collector has their own niche of guns that they are in to so to speak. Some collect military firearms, some collect antique rifles from the American West, some collect handguns from big names like Smith & Wesson and Colt and some collect foreign combat shotguns. All of these are great investments if you can get in on the ground floor, but there are some guns that try to carry the collectible label that you should stay away from if you’re planning on getting both a gun and an investment. Winchester over the years was responsible for making some of the most dependable and accurate rifles on the market but at the same time they have been churning out “collectible guns” to mark a certain event in history and these just never seem to increase in value from their new in the box price-tag. Rifles like the Legendary Frontiersman, the Little Big Horn and many others are probably the worst guns a collector can buy if they are expecting to make a profit someday. These guns can never be fired if one expects them to even hold their initial value and you had better have the box as well for many collectors to even look at them. All in all, these are nice guns to look at and if you want one and don’t mind the fact that shooting it will immediately decrease its value, have at it, but don’t buy one thinking you are going to turn a profit someday. It just won’t happen. The Mossberg ZMB, a.k.a. 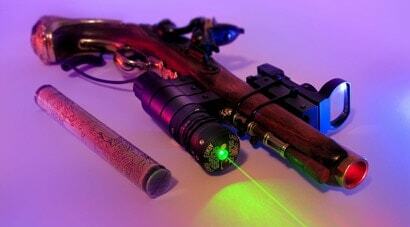 The Mossberg 500 with neon green paint. While the zombie craze is a big thing right now, face it, it’s a fad and like all fads they will go away and when they do anyone who owns one of these turkeys is going to be stuck with it just like a Apple II computer or a Beta VCR. It will be a neat conversation piece, may get some looks and hey, they still shoot, but I’m going on record here saying you won’t get any money out of it. This is a touchy subject because I know so many collectors who have guns in this category and I was in it myself once. I have vowed since to never be there again. 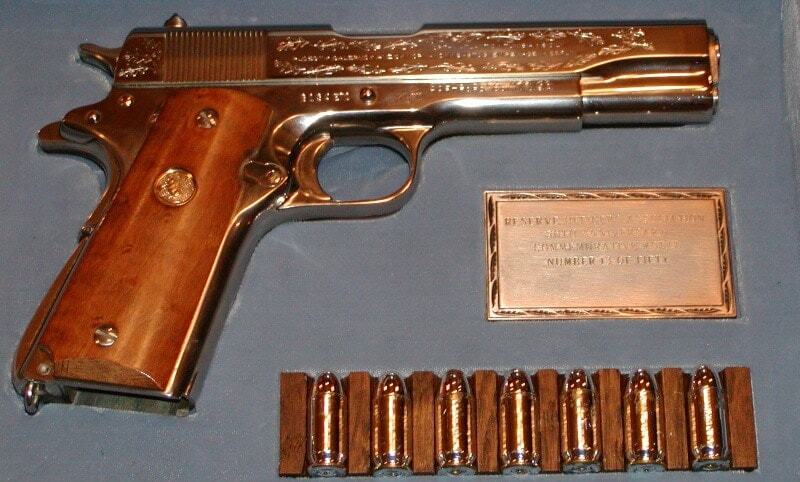 An engraved, silver plated 1911 with engraved bullets most definitely qualifies as a safe queen. According to the OED, a safe queen can be a rifle, a shotgun or a handgun that, because of its presumed value, never sees the light of day and if it does it never goes outdoors or sees a range or hunting trip. This is because when you buy this type of gun, the condition will be mint or as close to mint as possible and it must stay that way in order for it to keep its value. If the safe queen gets one scratch on it, any wear whatsoever, her crown comes off and she enters the wonderful but robust category of “shooter”. If you’re up to the task of protecting your queen, have at it but it’s not something I’m interested in worrying about. Because to me, the real problem with these guns is that the values are all over the place. On single models values can vary wildly and what one collector might call mint another might place it in another category, which could mean hundreds or even thousands of dollars. I say stay away from safe queen’s altogether. Stick with collectors’ guns you know are worth owning which should mean you can take it out of its case every once and a while. While these are not really what I would consider collectibles per se, I can see the novelty/oddity factor inherent in investing in some of the more visually impressive specimens and many it would seem are priced as collectors items. Additionally, with the possibility of another “Assault Weapon Ban” off in the distance (and a near guaranteed reality if we do not band together and fight it), I may tragically end up eating my words on this one, but I will include them here and for good reason. My objection to these types of guns as collector’s pieces is not because of their nontraditional look or any function of the weapon, but because of the ridiculous accessories and modifications clueless shooters can’t help themselves from hanging off these guns. 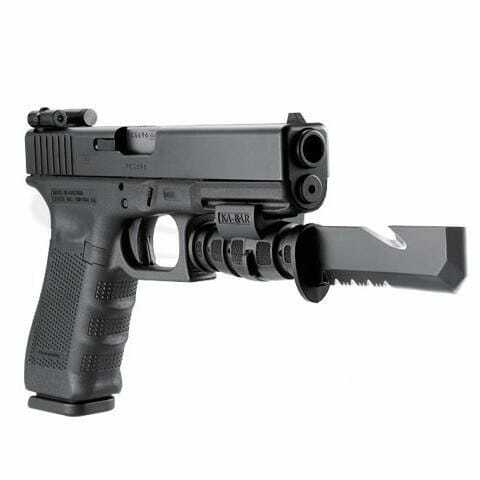 A Glock handgun with pistol bayonet and night sights (sells for about the same price as a used Glock 17). I’m not saying don’t buy accessories or that tactical gear doesn’t have its place. If you see a need for it, by all means buy it, train with it and use it if heaven forbid you should have to. But you need to realize most people (you included) will never have a use for a lasersight, flashlight, or whatever gadget hanging off of their gun and you are likely going to be selling that gun to most people. Novice and veteran gun owners pay way too much money for these gizmos and then think that they will see this money back when it comes time to sell the gun. To be sure, any money you spend on most gun accessories (certain scopes jump to mind as an exception) will be lost when you go to sell the gun and many modifications can in effect ruin any resale value of the firearm entirely. Earlier this year I watched a younger guy walk into my local gun shop with a Bushmaster AR-15 (ironically, one of the guns that may disprove my theory in the months to come) decked out with neat tactical extras, several magazines and an FAA approved case for travel. He left the store with $400. Granted he didn’t have to take the money, but he probably lost two thirds of his investment into that gun if not more. Another thing to remember is this: ban or no ban, every gun maker has been pushing tactical for like the past 10 years as has every gun magazine on the shelf. What does this mean? It means there are a lot of tactical rifles and do hickeys are on the market and with modern polymers dominating the scene, they are likely to last a long time. So do yourself a favor and wade through all the bovine excrement carefully before you spend a lot of money on some super cool wonder gun for personal defense you think you’ll see back some day. While the guns listed above are not the best guns for long term investments, there are some great guns out there to buy that will and can make your money, but you need to do research first. Avoid the fads and the hype of what is popular right now, you want to look into what has been making money with guns over the long term and stick with it. Guns are like stocks and investments in a way, and there are some that are worth the money, and others that are some real lame ducks. Do your homework and your goose won’t get cooked.